Ensure that your stock shares are distributed to heirs as you intended. Planning your estate lets you control who gets your stock shares upon your demise. You can transfer your shares through a last will and testament or by creating a trust. You can also gift your shares to your heirs before you die to avoid probating your will or administering your trust. 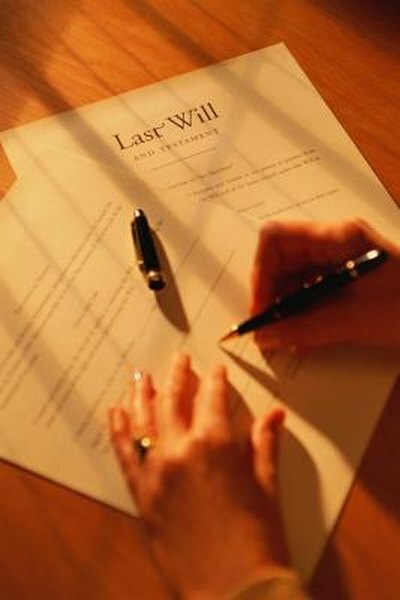 If you do not gift your shares or leave a will or a trust, your state’s inheritance laws determine how your assets are divided. In that case, some of your heirs could receive all of your assets while others receive nothing. You can allocate your stock based on the number of shares or on the dollar value of those shares. For example, you own 100 shares of stock in Company A worth $10 a share, or $1,000, and 100 shares in Company B worth $20 a share, or $2,000. Together the shares are worth $3,000. To distribute equal shares, each heir would receive 200 shares divided by four, or 50 shares. To distribute equal dollar value, each heir would receive $3,000 divided by four, or $750. You can use a will to transfer your stock shares to your heirs. Your will must name each heir, the specific stock and the number of shares to complete the transfer. If you purchased stock in the same company multiple times, there could be confusion over which heir receives which block of stock. To avoid this problem, list the stock certificate CUSIP number to identify which heir receives which particular stock. The probate court will distribute the shares to your heirs once your estate administration is completed. By using a trust to transfer your stock shares, you bypass the probate process and avoid the time and expense of administering your estate. You must first transfer the stocks into the name of your trust, and the trust holds the stocks until your demise. The procedure to transfer your stocks with a trust is similar to that of a will. You name each heir and list the name of the stock and the number of shares you want transferred. However, if any disagreement among the heirs cannot be resolved, the trustee must open a probate estate and have the matter decided by a judge. You can avoid the expense of a probate estate and the potential problems of a trust by giving your stocks away to your heirs. At the time of publication, the Internal Revenue Service lets you give a $14,000 tax-free gift to each of your heirs every tax year. If you are married, you and your spouse can make a combined gift of $28,000 to each heir. As long as the gift remains under the $14,000 threshold, there is no tax liability to either you or your heirs. The tax-free gift limit for 2014 is not adjusted for inflation but remains fixed at $14,000 per heir.